Registration fee is $60 per person. 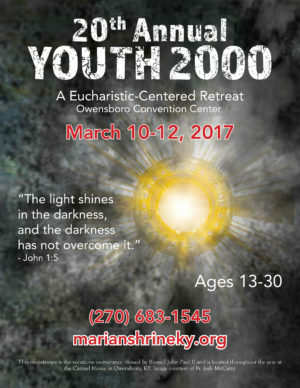 Youth 2000 is a eucharistic-centered retreat for middle and high school students, college students and young adults ages 13-30. March 10, 6:30 p.m. – 10:30 p.m. • March 11, 9:00 a.m. – 10:00 p.m. • March 12, 8:30 a.m. – 12:30 p.m. Please click here to download an individual registration form and click here to download a group registration form. Registrations are limited to 900.